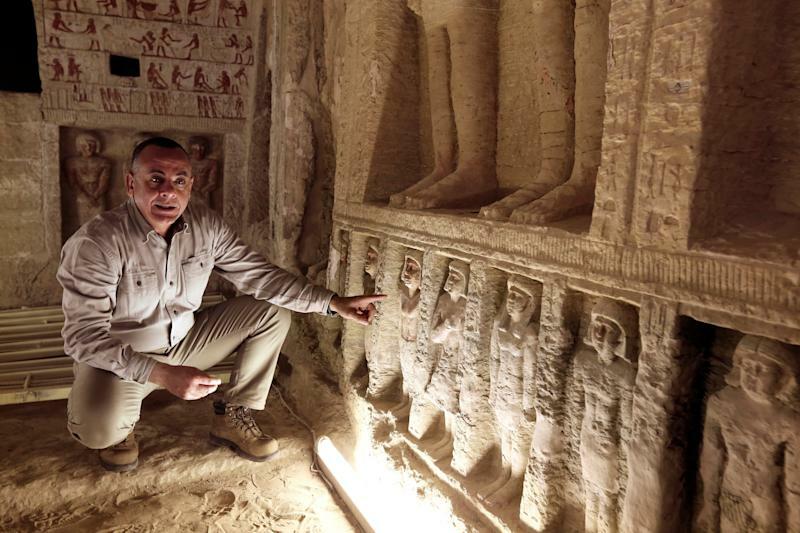 Mostafa Waziri, secretary general of the Supreme Council of Antiquities, speaks inside a recently uncovered tomb of the Priest royal Purification during the reign of King Nefer Ir-Ka-Re, named "Wahtye. ", at the site of the step pyramid of Saqqara, in Giza, Egypt. Egyptian officials said they have discovered a 4,400-year-old tomb linked to the fifth dynasty of pharoahs. According to Egypt's Ministry of Antiquities, the tomb — located at a site west of Cairo in Saqqara — belonged to a senior official of the pharoahs, reports The Associated Press. The tomb contained drawings and statues depicting the official and his family. Antiquities Minister Khaled al-Anani tells CNN the tomb belonged to a royal purification priest named Wahtye. Mostafa Waziri, secretary-general of the Supreme Council of Antiquities, described the discovery as "one of a kind in the last decades," reports Reuters. A key reason the discovery was so important is drawings and statues found in the tomb were well preserved. “The color is almost intact even though the tomb is almost 4,400 years old,” Waziri told Reuters. The Ministry of Antiquities said more excavations are planned to determine what's inside five burial shafts found inside the tomb.